Circa 1898. 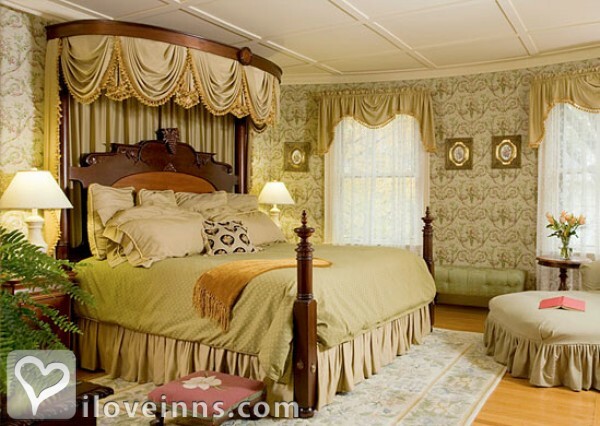 Berry Manor Inn is an award-winning bed and breakfast in Rockland, Maine offering a romantic and relaxed setting. Situated in a quiet neighborhood in the historic district, this inn features 12 spacious guestrooms offering luxurious accommodations, beautiful antiques and period reproductions. Each of the guest rooms feature cozy fireplaces, whirlpool or clawfoot tubs, fine linens, bathrobes and comfortable sitting areas. 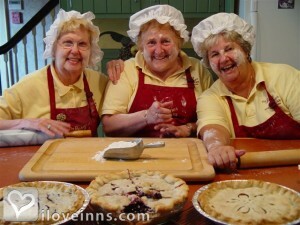 Enjoy a delicious gourmet breakfast each morning and incredible pies any time of day made by the famous pie moms! Payment Types Accepted Include American Express, Personal Checks, Travelers Checks, Master Card, Visa and money order. This property has 12 total guest accommodations with private bath, 12 with fireplaces, 8 with whirlpools, 1 two-bedroom suite and 1 conference room. The types of beds available include King, Queen and Twin. Free secure high-speed Internet access on premises, Computer workstation with printer for guest use and fax services on premises, Access to local gym available for guests. We have a rescue cat on premise. He is mostly outdoors or in our space but is seen occasionally in the common areas. Only AAA Four-Diamond rated historic B&B inn in midcoast Maine. All rooms are supplied with candles, lights on dimmers, soft music, high-count luxury linens and custom mattresses. 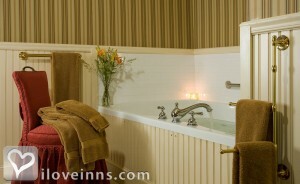 Soft fluffy robes and bath oils are provided and set the stage for romance. 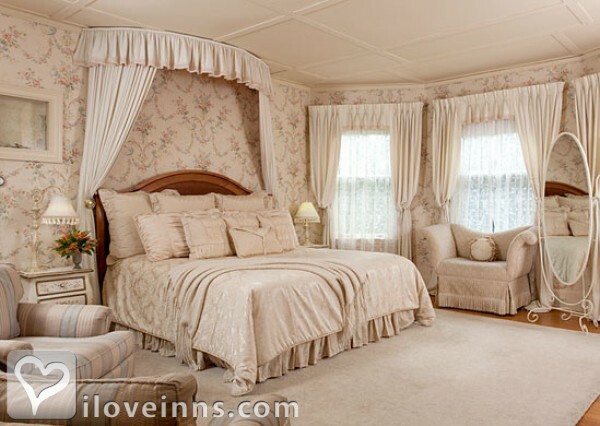 Rose petal turndown service is offered as well as special romance packages. 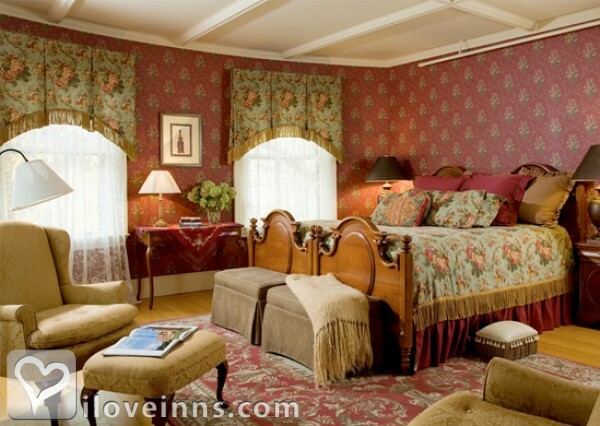 All rooms feature fireplaces and beautiful custom beds and bed linens. We offer fabulous romantic turndown packages also. 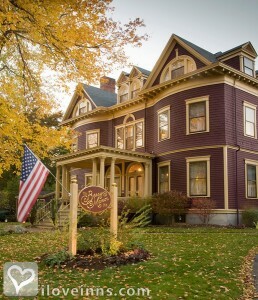 The Berry Manor Inn was the first B&B in Rockland to be certified as an Environmental Leader in Hospitality by the State of Maine. We have many green practices at the inn including a Tesla/Universal electric car charging station; collecting our food waste and compost for a local farm; source local foods; collect used soap bars for "Clean the World" campaign. See our website for a full list. Quiet residential neighborhood walking distance of the downtown shops, museums, restaurants and harbor. We have beds of perennial flowers and shrubs on our tree lined property. Our gardens are often part of local community garden tours. Certain holidays, special events or packages do have minimum night stay requirements. Please ask when booking. We cater to adults looking for a romantic escape from the pressures of home and work. Children with well behaved parents are welcomed. Please note that we do not have high chairs, portable cribs or children's menus. If a cancellation or change of reservation occurs within 10 days of the stated arrival date the guest is responsible for 100% of the reservation. Cancellations or changes made prior to 10-days of original stated arrival, the advanced deposit (50% of total reservation or 1 night whichever is more) less administration fee ($35 or 10% of advanced deposit whichever is more). Tons Of Stuff To Do! Built in 1898 with all the grandeur of the Victorian age as a wedding gift for his new bride, this shingle-styled mansion was originally the residence of Charles H. Berry, a prominent local merchant. Listed on the National Registry. At the turn of the century, Rockland Maine was the 4th busiest harbor on the east coast. Gen. Knox Museum, home to Washington's #2 man, featured in the bestselling book, "1776", Gen. Hiram Berry was uncle to the gentleman that built this house. Rockland's Historic District features over 145 homes and buildings that cover an array of architectural styles and dates. Walking tours available and the Rockland Historical Society has a wealth of information. An Amazing Place for Our Honeymoon! What an amazing place to stay for our honeymoon! The Rockland area is so beautiful during the fall and provided us with so many wonderful activities- from museums to hiking, and even the Fryeburg Fair! Berry Manor Inn is absolutely stunning! Breakfasts are delicious, the people are friendly and welcoming. Room 11 was the perfect place to spend our honeymoon. The bed was so comfortable and THAT TUB! We looked forward to the "hot tub" every single night. Thanks for making our honeymoon stay amazing. We hope to be back soon for more delicious pies and a rubber duck friend! Thank you for making our elopement the special, intimate event we were dreaming of. Every possible detail was taken care of and we were able to have the romantic, peaceful wedding we wanted. The pies were delicious, the room was amazing, and we will definitely be looking forward to returning to celebrate our one year anniversary here at the inn. Thank you again for an amazing experience! The day before we arrived here, I married the most amazing woman. It was a picture perfect day. Only adding perfection to our wedding day were the following days spent here at the Berry Manor Inn. The staff was so welcoming and accommodating. Our room was incredible and the meals were wonderful. Arrangements were made at Primo and the Samoset where my wife and I enjoyed incredible meals and service. I'm quite sure when reservations were made for us that someone mentioned we were newlyweds on our honeymoon. We could not have received better service anywhere. I cannot thank the folks here at the Berry Manor Inn enough. What a wonderful experience. We will be back soon. A Honeymoon All Over Again! We loved our stay here! We are celebrating our 10th wedding anniversary and driving the coast of Maine for a week. The staff are incredible! Our room was the perfect room and very romantic. It felt like a honeymoon all over again. Thank you for an amazing stay! We haven't even left yet and already can't wait to come back for another stay. My husband just returned from his second deployment, so we left the baby with nana for a night and this was our first time being alone in over a year. I'm so happy this is the place we chose for our romantic getaway. From the moment we walked in we have been blown away. JP has even said numerous times that he feels like royalty. We didn't want to even leave the room for dinner last night. And that shower... YES! Thank you for providing such a unique and romantic space for us to reconnect after his tour. We could not be happier. If I could have written a script of how I wanted my wedding to be it would not have been as perfect as it was here at the Berry Manor Inn. From the beautiful room, the food, the wonderful hospitality. They took care of every detail to perfection. The cake, toast, the ceremony- beautiful! Made all arrangements for 3 fantastic dinners including my first Maine lobster and horse and carriage ride. Last but not least, came home from our wedding dinner to a bed full of rose petals, champagne and chocolate covered strawberries. Thank you Mike, Cheryl, and Jordan! P.S. Best part- married the man of my dreams. Thank you for the memorable stay we had for our 25th Anniversary. 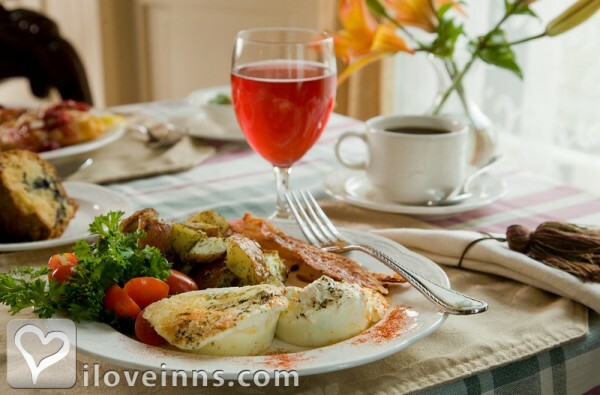 We have stayed at several Bed and Breakfasts throughout Maine and have never been pampered so well. We felt welcomed and relaxed. All of the extra touches made us feel very special. We are proposing to make our stay an annual event. Staying here makes us lose all track of time- willingly. With top notch hospitality and accommodations, who wants to count down days to departure? We have had the chance to experience a bit of everything, all the charm and charisma the Berry Manor and its staff has to offer. Did we mention the 24/7 pie? Our honeymoon has been a most memorable trip thus far (how it's supposed to be, right?) 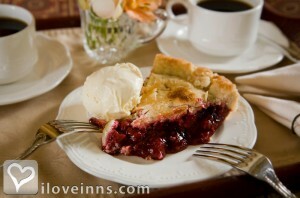 But I think the romantic atmosphere of this beautiful inn is the icing on the cake- or should I say the crust of the pie!? Our stay here was so fabulous. All the little extras Cheryl, Mike and all did for us was wonderful. It made celebrating our 25th Anniversary that much more special. From making dinner reservations to reservations for our day outing to even getting us a cab to town, thank you for making us feel so special. This place is truly spectacular. I hope we are able to return. The food and pies were terrific. The room wonderful. We will definitely recommend this place to all our friends. Thank you for a great weekend. Thank you for making our wedding absolutely perfect. It was the most special day. We would not change one thing, not just the day but our entire stay at the Berry Manor Inn has been magical. I can not even express how happy we are. Thank you to Cheryl, Mike, Angie, and Lori, Peggy and P.J.!! I took my wife to Berry Manor for a romantic getaway on her birthday. We had a fantastic time. 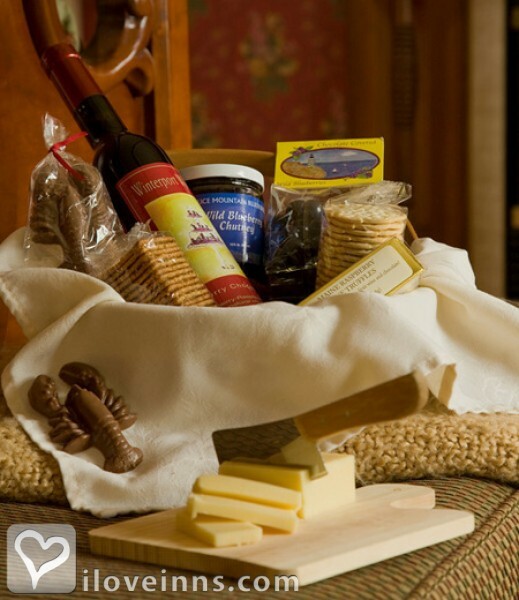 The Inn is walking distance to restaurants and shops. we stayed in one of the Carriage House rooms. I had Mike and Cheryl arrange to have a birthday cake waiting for us in the room when we got back from dinner. Very romantic. Wow. We can't wait to go back. My husband and I thoroughly enjoyed our one-night stay here. Innkeepers, Cheryl and Mike couldn't have been more pleasant or welcoming. Our room was comfortable, immaculate, and beautifully-decorated. Ask Mike about the Pie Moms and the Bobby Flay throwdown and prepare to be entertained. Wish our stay could have been longer. When my husband and I started planning our trip to Maine (August 2013) the only item on the agenda at that time was, "Stay at the Berry Manor Inn". We were greeted by the very nice Assistant Inn Keeper who gave us the history and grand tour of the home, introduction to the guest pantry and showed us our room. We were VERY happy with our stay, the blueberry pie with ice cream, CLEAN & COMFORTABLE huge room (#5) and bathroom and the delicious breakfast.The dining room at the Berry Manor Inn was arranged with cozy, elegant tables of two or three and there was a time frame for breakfast which we like much better than typical B & B's where there is one table and everyone sits together. The breakfast team was also very friendly and attentive to each guest as they "drifted" in and had a seat at a table. We would absolutely recommend 100% this home to everyone. 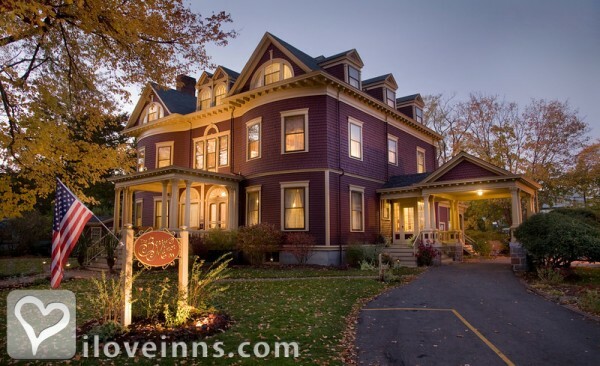 Named one of Top Ten B&Bs in US by TripAdvisor (2008), Discerning Traveler, Downeast Magazine, Maine Times, Boston Globe, Boston Herald, Maine BIZ, Yankee Magazine's Editors Choice (2006), Best of the Best B&B in Midcoast Maine (2007), Food Network's "Throw Down with Bobby Flay" for the Berry Manor Inn Moms, Appearances on Maine's "207" Magazine show., Midcoast Maines only AAA 4-Diamond rated historic B&B inn.